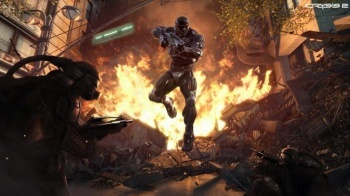 Crytek says is it "disappointed" that Crysis 2 found its way online. With less than two months to go before its official release, a nearly complete build of the sci-fi shooter, Crysis 2, found its way onto the internet, complete with the DRM keys needed to make it work. Obviously, this news hasn't gone down well at developer Crytek, and the studio is asking people not to download the leaked version. Writing on the official Crysis 2 site, Crytek said that it and publisher EA were deeply disappointed by the news of the leak. It encouraged fans to support both the game, and the people who made it, by purchasing the completed version when it came out in March. It also said that piracy continued to threaten PC gaming - specifically the packaged goods market - and the PC development community. These comments sparked off the inevitable debate about the effects of piracy, with some people getting the idea into their heads that Crytek was blaming PC gamers for the leak. The leak is bad news for Crytek, although it's not as bad as it could have been had Crysis 2 been a PC exclusive like its predecessor. It seems unlikely that Crytek's pleas will be that effective in curtailing further downloads of the game, but hopefully, it will make at least a few people reconsider and wait for the official release instead.